A secret life, daydreaming vs. experience, and a way of seeing. On Monday afternoon, my kid and I went to see Ben Stiller’s remake of The Secret Life of Walter Mitty. I have always loved James Thurber’s short story of the same name. Honestly, I did not expect Stiller’s remake to stick to Thurber’s short story very much, as I’d felt that the 1947 version with Danny Kaye had not been very close, either. But nonetheless, I found this film slightly amusing, poignant, and very inspiring. ….And that is exactly what I enjoyed about this film. For example, the most wondrous, unexpected moments for me were connected to seeing the footage of Greenland, and Iceland, for several personal reasons. You know, I very nearly cried with delight, seeing Walter as he skateboards down an almost impossible winding road into the town of Seyðisfjörður just before the volcano erupts. He glides down this road as it snakes past these lovely rocky cliffs that rise up on either side. Those mountains, those cliffs….aw, man. Just beautiful. It was exhilarating just watching that, for personal reasons, as well. The other moment that struck me so much, concerned vision, experience, and the photographer’s eye. When Walter finally catches up to the photographer that he’s been pursuing, the photographer is ‘waiting for the shot’ of a snow leopard in the Himalayas. He and Walter sit quietly waiting, talking softly, until the snow leopard comes into view. They are hushed and still, and we, as viewers, see their view through the camera lens for a good minute or two, before the leopard moves out of range. Sometimes I don’t. I just look. I just see it. That moment is a red cardinal sitting on my backyard fence. Stop trying to capture the moment, fearing the loss of the memory of the moment. Just let the moment unfold. You don’t have to hold it in place. 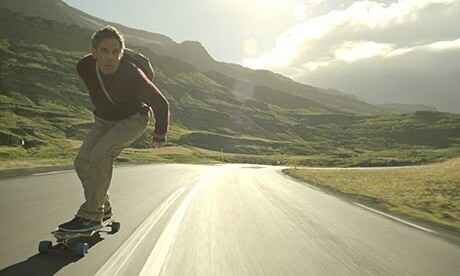 And I loved that Walter Mitty, in this film, became what he was – not by daydreaming – but by doing, by allowing himself to see, to experience life itself. In my opinion, that’s good advice.